Ericsson Mfg. Ltd. is always striving to find ways to improve your work environment. Ericsson Mfg. Ltd., the proven product on the Recognized Product List for the BC Ministry of Transportation and Highways, Report 350, Federal Highways, CALTRAN and WSDOT approvals included. Proposed for a 2 -3/8" O.D. circular post. 1/2" by 3/4" stainless steel set screw included. Proposed for a 2" square tube post. 5 mm (3/16") thick wall, drill hole for 3/8" bolt or rivet. Proposed for a 1 -3/4" square tube post. Double sleeved telespar wall, drill hole for 3/8" bolt or rivet. Concrete bases come with a standard break -away sleeve of 6" thereafter a well through the concrete base. Bases are also available with a full length sleeve --recommended when installation of the sign post does not go the length of the concrete base. Proposed for a 2 3/8" O.D. circular. 1/2" by 3/4" stainless steel set screw included. Proposed for a 1 3/4" square tube post. Double sleeved telespar wall, drill hole for 3/8" bolt or rivet. Concrete ring reinforced with 2 rebar rings, approx. weight 25 kg (55 lbs). Size being 18 1/8" I.D., 3" thick. Sidewalk sleeve proposed for 2 3/8" O.D. circular pipe post 1/2" by 3/4" stainless steel set screw included. Available in 12" or 18" lengths. Square tube variety available as well. Concrete base with extended sleeve was designed for the use with paver stones. The extended sleeve allows for space for the installation of pavers without hindering the use of the break-away sleeve. The sleeve extends approx. 5 1/2" above the concrete. Available for use with the pipe sign post, weight 32 kg and 24 kg. These concrete bases are ideal for wood fences. They are available for 3 1/2" sq wood post or 4" sq wood post. There is no more waiting on ready set to harden, just dig your hole, drop your base in and install the wood post with two 3/8' nut and bolt. Notice how the wood post is elevated off the concrete base by 1/8"to 1/4". This prevents the wood post from drawing any moisture from the base which ultimately adds longevity to the wood post. These bases are available in 46 kg weight and dimensions. This new base is used for Cable Barriers. It is a precast base at 211 kg (465 lbs). The base is 11" square at the top, 13" square at the bottom and 39" height. 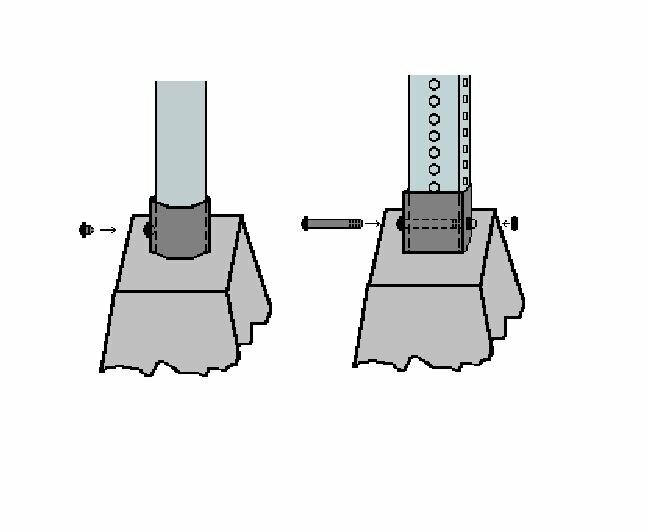 The steel insert is provided by the customer and is elevated 3/4" above the concrete to accommodate a drill hole for 3/8" bolt/pin for lifting purposes. Please contact Ericsson Mfg. Ltd for current pricing. Prices are based on min. order of 12 pcs. Cable Barrier Bases are stacked 6 pcs standing on a skid. Weight Length Top Sq. Bottom Sq. Common Applic. ** for use in applications with low lying obstructures limiting the depth for burial - note this base intended for use with concrete patch -to secure the base. 1. Dig a hole slightly larger than the bottom width of the concrete base. 2. Insert the post or lifting tool into the sleeve and slide it downwards to the bottom of the base. Secure with set screw provided or 3/8" bolt for square tube post. 3. Place the base in the pre-dug hole *leveling the top concrete with ground level. Note: the placement of the base is critical to obtain maximum strength of the base. The concrete of the base should never protrude above ground level. Bases are available in a variety of sizes to meet specifications. 4. 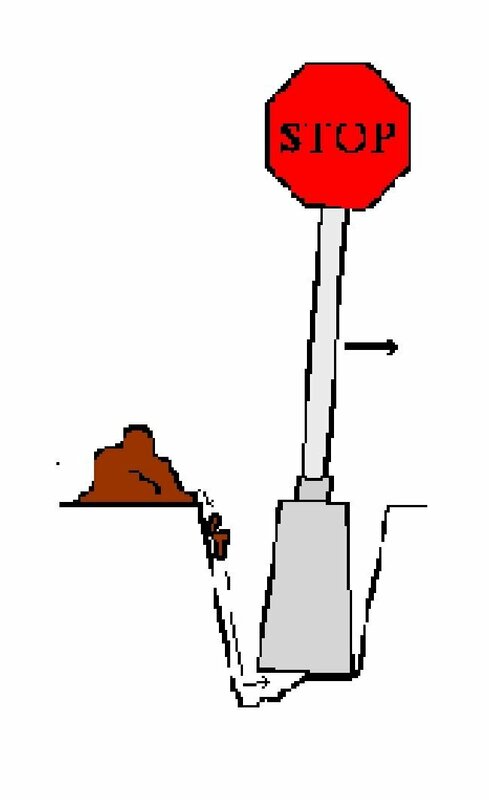 To level the post and concrete base, scoop some dirt on the one side of the base while leaning the post in the opposite direction until dirt falls under the base. Repeat this procedure for the other side if necessary. .
5. Once the post is level, refill and pack remaining dirt.In a couple of weeks, rain will compact the ground surrounding thebase making it very stable. 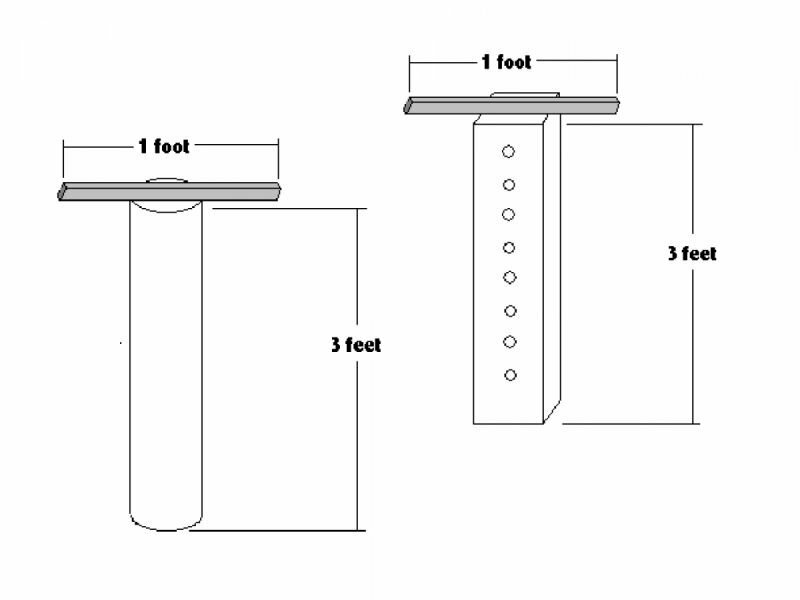 The diagrams depicted are recommended for use in installation of the concrete bases. Ericsson Mfg. Ltd. does not produce the lifting tools but scrap sign post can often be used to create a version of the diagram. The lifting tool center piece (3 ft in length) made from standard sign post material. The handle (1 ft length) can be made from angle iron, flat bar, or a square tube piece. For use with the freestanding base, it is recommended the top cross bar material be 3 ft to accommodate the 19" width of the freestanding base. This will allow one person to walk easily on each side of the freestanding base.Tighten set screw or 3/8" bolt to secure tool to the concrete base when lowering into pre-dug hole. The handle (1 ft length) can be made from angle iron, flat bar, or a square tube piece. For use with the freestanding base, it is recommended the top cross bar material be 3 ft to accommodate the 19" width of the freestanding base. This will allow one person to walk easily on each side of the freestanding base. Tighten set screw or 3/8" bolt to secure tool to the concrete base when lowering into pre-dug hole. Ericsson Mfg. 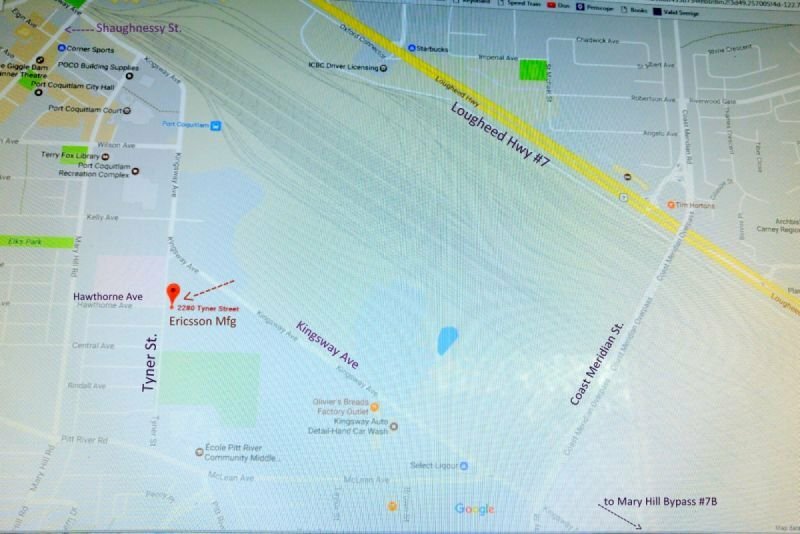 Ltd. is located in the heart of Port Coquitlam, BC. For our shop address, please contact our office.